The best selling Little Blessings line features captivating art from Care Bears artist Elena Kucharik, along with light, upbeat text from Kathleen Bostrom. Preschool children and adults alike can now explore the mysteries of heaven. About "What About Heaven? (Little Blessings Series)"
Children ask what will we do in heaven? With scripture passages, this work isritten in a way that children should understand. The book is part of theittle Blessing series. Kathleen Long Bostrom is a Presbyterian pastor and the author of several books, including "99 Ways to Raise Spiritually Healthy Children" and "Finding Calm in the Chaos: Christian Devotions for Busy Women". Kucharik, well-known Care Bears artist, has been a freelance illustrator for the past twenty-five years. For the last eight years she has focused her talents in the area of children's book illustration. Customer Reviews For "What About Heaven? 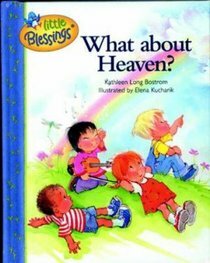 (Little Blessings Series)"
What about heaven is a well illustrated and scripturally sound question and answer book (in rhyme) about some of the most common questions children might have about heaven. My 4 year old loves this book and often asks me to read it to her. BIBLE FOR LITTLE HEARTS provides Bible verses that comfort and encourage, and prayers to use throughout the day. PRAYERS FOR LITTLE HEARTS offers heart-warming prayers from Bible passages. PROMISES FOR LITTLE HEARTS presents Bible promises for special days in your child's life. All three delightful volumes feature endearing artwork from Elena Kuckarik. Padded Hardback.